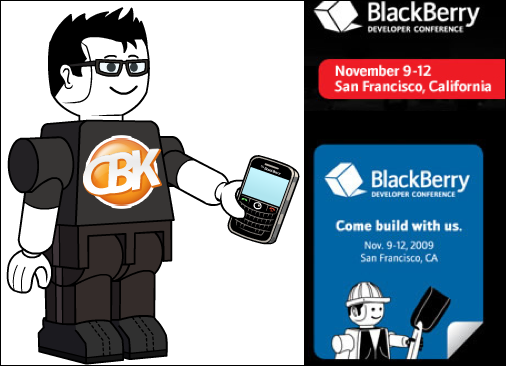 CrackBerry Coverage Goes to San Francisco Next Week for the Second Annual BlackBerry Developer Conference! SAN FRANCISCO HERE WE COME!!! Monday kicks off the 2nd Annual BlackBerry Developer Conference and CrackBerry.com will be there in full force. Adam, Bla1ze and myself will be blogging the news, live-blogging the general session, recording podcasts, conducting interviews and doing up some videos if and when applicable. Keep it locked to CrackBerry.com for all sorts of DevCon goodness. This event is about the BlackBerry platform and is for the developers in attendance - don't expect any device announcements during the week (plus the Storm2, Bold 9700 and Curve 8530 have just all been announced in rapid succession), but we're bound to see some cool things get displayed that you won't want to miss. If you're a developer attending DevCon, reach out to us! We want to meet you over the course of the week and get to know you. Want to say hi to CrackBerry Nation? We'll interview you and feature your app on the blogs! Want to get some tips on how to engage the CrackBerry community to build better apps and promote them? We'll share our experience and give you the do's and don'ts. Definitely do not be shy. If you see us walking, stop us and talk to us. And if you somehow miss us during the day, the odds are good you'll find us at the hotel bar late at night. See you @ DevCon! !